Our girls are big on their music, and considering our commutes to and from work/school every week day, we get a lot of it in during the week. 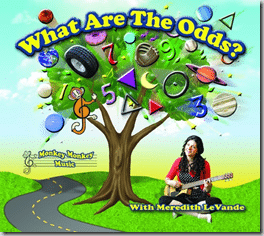 Our newest CD we enjoy is Monkey Monkey Music’s What Are The Odds with Meredith LeVande. It has a youthful-pop music feel to it, with lyrics that are fun for both girls (almost 4 and 2). You can listen to sample lyrics on their site, too. In addition to silly songs like “Who’s a Knockin'” there are also educational songs like “What Are The Odds” which include counting by odds and things that are that number (like one hand, three sides to a triangle) and more. Win It: You can win your very own copy of What Are The Odds..
First Entry: Leave a comment. *Contest ends Wednesday, September 15th at 9pm EST. Winner will be posted shortly after. I was provided a copy of What Are The Odds to review. All opinions are my own and may differ from your experience. No other compensation was received.. I never considered having children’s CDs but I am sure I will need to soon with Connor! my daughter loves to sing and dance. this would be perfect! You always find the best CD’s I love this! Maybe I will be able to use this one in my classroom!